The first race was held in 1912 and was the first road race ever for motorcycles in Sweden. Motorcycling was the real challenge for both men and machines. After some amusing hill climbing at Tinkarpsbacken north of Helsingborg the bike riders climbed onto their machines again and rode a good 500 km round trip in the province of Scania (Skåne). With spare tyres snaking around their necks and Jerry cans on the luggage carrier they set off. The roads at that time were like washboards with a few wheel tracks. Backup vehicles, service personnel and mechanics where thin on the ground. Service was up to the rider; if he was lucky he could get help from a friendly blacksmith. 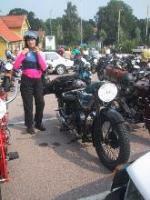 The roads and bikes improved and the event was held annually until 1939 when the war in Europe broke out. 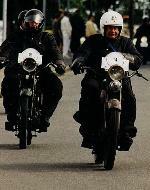 Skåne Rundt was restarted in 1970 as a rally for motorcycles manufactured before 1946. 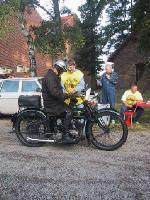 The southern section of Motorcykelhistoriska Klubben (MCHK) was responsible for the organisation. Since then it is regarded as one of the most prestigious events of its kind in Scandinavia. Follow Skåne Rundt in the province. Every year, the route deviates a little from last year, to create variation for regular visitors and as a result of roadwork. All drivers are supplied with a detailed roadbook and the precise route will not be public until registration begins in Fredriksdals Friluftsmuseum. Skåne Rundt on a motorcycle is "the beautiful travel through southern Sweden in the province of Skåne", a district with cultural traditions spanning thousands of years, once part of he Danish Viking Empire, where relics of stone-age culture occasionally appear behind the hi-tech of modern times. 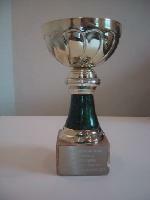 One individual award for overall winning driver (Challenge Cup). 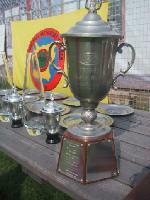 An individual award for the winner, second and third in each class. Challenge Cups for best driver on a Husqvarna, Suecia, Italian, German, Harley-Davidson, Oldest Husqvarna and Best Female Driver. Best National Team, Club and Section Team, One Make Team and Youngest Rider. A machine may only be changed from the applied with written permission of the Secretary of the Meeting minimum 7 days before the start of the rally. The same machine must be used throughout the event. One numbered card will be provided by the Organisers and must be clearly displayed at the front of the machine and must be removed immediately after the event. Machines rejected by the Machine Examiner will not be allowed to take part in the event. Rescue vehicles with service mechanics and a basic supply of spares will follow the machines on the road. Drivers, passengers and machines must comply with all legal requirements of their home country as well as all Swedish such requirements. Drivers should ensure that their Third Party Insurance cover is valid for this type of event. Drivers may be required to produce proof that they comply with the legal requirements at any time during the event., and a valid drivers license. Protests are considered by the Clerk of the Course. His decision is without appeal. A fee of SEK 100 must be paid together with the protest. If the protest is granted the fee will be returned. Hotels and Guest House are available in Helsingborg and near Fredriksdals Friluftsmuseum. Information can be requested from the Secretary of the Event. Start and Finish is at Fredriksdals Friluftsmuseum. The route is circa 550 kilometres on public roads. A detailed road book will be given each competitor at his registration in the Secretariat. Distances given are approximate. First start is Saturday at 08.00. Drivers will be started in order of participating number with 30 seconds intervals. There will be timed sections. Average speed will be decided by the Organisers and noted on starting card. Drivers waiting within sight of a Time Check will be punished. There will be a quiz competition, with questions related to motorcycle history. Drivers receiving outside help on timed sections or quiz will be disqualified. Timing is established by undivided minutes. Punish marks are given for a maximum of ten minutes. Driver not present at 08.00 Saturday morning shall be deemed to have retired. Driver arriving at the Finish later that Sunday 16.30 shall be deemed to have retired. First start on Sunday will take place with cold motor, at the risk of punishing marks. Any driver using electronic time, distance or average speed measuring equipment will be disqualified. The use of rescue vehicles with service mechanics will result in punishing marks. The organisers reserves their right not to be kept responsible for any damages to participant or their property, as well as damages to third party caused by participants. Today's roads are much better and competitors have two days to complete the same route as in 1912. After a good dinner and having experienced Scanian hospitality competitors are put up for the night. A calm pace and no rush, but nevertheless Skåne Rundt is a challenge to both riders and machines. Having participated in Skåne Rundt is something one can be proud of. Even in modern times it is a challenge. If you have not experienced it you don't know what you have been missing. It demands rider and machines in good condition, willingness and patience. After completion of Skåne Rundt rally you can put a quality stamp on yourself and your machine.
" Has completed the Skåne Rundt rally"
The evening before the rally the competitors gather for a simple dinner. Comradeship, cosiness, pleasure in reunion with friends from last year's Skåne Rundt and making new friends are some of the feelings present at this occasion. Two days together with enthusiasts sharing the same interest. The excitement of travelling through the varying countryside of Skåne, The castles, farmyards, the rolling fields, white beaches, green beech forests in the south contrasting with the rocky conifer landscapes with small red cottages in the north. 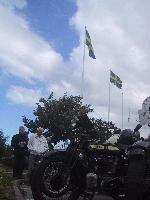 The rally shows the province of Skåne from its most varied perspectives. An annual international event open for riders and passengers on motorcycle manufactured up to December 31, 1939. 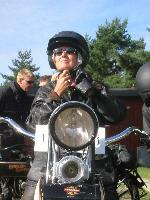 The riding takes place in the province Skåne, starting Saturday morning in the Helsingborg area. The course runs for about 550 km along coasts of the province and cuts inland across the province back to the west coast. Start and finish are at the same location. The route is almost the same as in 1912. Several companies sponsor the rally. This helps to keep entry fees down. Included in the entry fee are accommodation (Saturday night) and all meals between start and finish. Breakdown service is also included (but not spare parts). During the rally there are more than 50 officials along the route, in follow up vehicles and in service organisations. The number of entrants is limited due to limitations in accommodation and costs. Those arriving on Friday afternoon can participate in a simple dinner with fellow competitors. This dinner is not included in the entry fee, and a reservation must be made in the entry form if you intend to join this event. First start is at 08.00 hrs Saturday morning and it will take about 1 hour to get all the machines underway. The rally heads into the Scania landscape and continues all day with breaks for tea and lunch up to the goal for the first day where we have dinner and spend the night. First start the second day is 08.00 hrs. Lunch is taken along the road heading for the finish in the Helsingborg area timed at about 15.00 hrs. The competition is individual and for teams and in different classes. Teams can enter the competition as a country, motorcycle make or club team. Each team shall comprise of 3 drivers. Prizes will be awarded in the different classes after the finish and after any protests have been handled 15 minutes after results have been announced. Entry to the competition is made by sending the filled in enclosed entry form and by paid fee. The event will be based at Fredriksdals Friluftsmuseum in Helsingborg, which is the locality of Start and Finish. 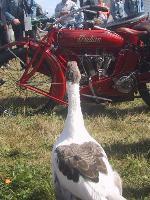 The event is open to motorcycles manufactured not later than December 31, 1939. Entries will be registered when the organising committee has received entry form as well as entry fee. The number of participating machines is limited. See current application form avaliable spring. 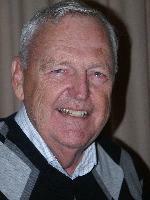 The entry fees include a souvenir award, accommodation Saturday night, lunch and dinner Saturday and breakfast and lunch Sunday. Dinner Friday evening is at additional cost. Personal baggage transport is free during the event. As part of the individual competition there is a team competition. Only one of the categories below can be chosen by each rider. 1. National teams should comprise 3 drivers. 2. Section or Club teams should comprise 3 drivers. 3. One make teams should comprise 3 drivers on the same make of machine. Team entries must be notified on the entry. More detailed rules will be avaliable as application form for current year is avaliable either by mail or on this site. The route and rules may vary some from year to year, and up to date information is avaliable on this web site for current year.